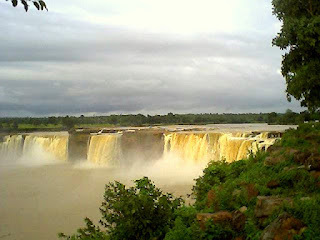 Chitrakot is one of the famous tourist spot in Chhattisgarh. This beautiful fall is on Indravati river. 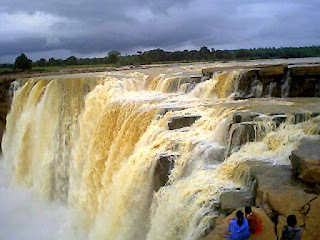 The approximate height of the Chitrakot fall is 100 ft. Chitrakot is considered as Mini-Niagara fall because of its shape as horse-shoe. The beauty of the fall is enriched in rainy season. Chitrakot is worth a watch especially in rainy season, between the months of July and October. Chhattisgarh Tourism has put effort to develop this as a good tourist by providing water boats, canteen, park etc along with flash lights so people can enjoy the beauty of fall at night. To visit Chitrakot, one will have to reach to jagdalpur. Jagdalpur is connected by bus to Raipur and Hyderabad, and by train to Vishakhapatnam. Chitrakot is 38 Km away from Jagdalpur. It takes a drive of about an Hour to reach Chitrakot. Sound of water can be heard from a distance, and even the force of water can be realized by the sound. Park is maintained on the top so that people can sit and enjoy the beauty of the fall. Chitrakot is surrounded by greenery which adds to the beauty of the fall. In presence of sunlight rainbow is formed which adds to the beauty. One can spent hours by simply sitting and enjoying the magic of the nature. 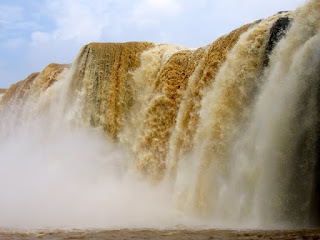 If one is not satisfied, they can also move down at the bottom of the Chitrakot and get a clear view of the fall which is not possible from the top. It is a nice place to have picnic, snacks are available at near by hotel but it is insisted to get food from home or hotel from jagdalpur. 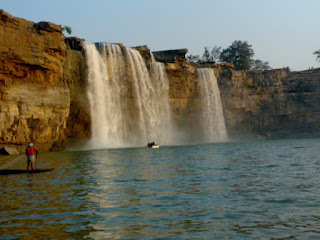 At the bottom boat-ride is also available at nominal rate so that people can have closer view of the Chitrakot fall.Also some wooden crafts are also available to buy depicting the local tribal culture. I would insist u should buy some as it would add beauty to your house as well as will work as memento. Important aspect Bargaining is a must.